Knights of Columbus Kitimat Council #5148 made their annual scholarship presentation on 4 June 2015. The council has awarded scholarships to selected children or grandchildren of council members for 30-40 years. 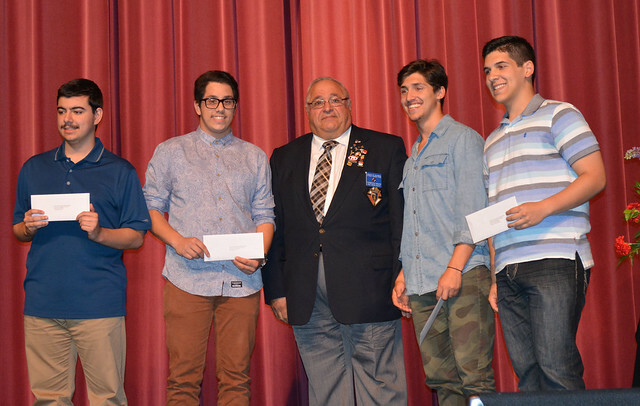 This year, Grand Knight Frank Mauro presented four Scholarship’s to local students at a ceremony at the Mount Elizabeth Theatre. The Scholarships of $ 1,000.00 each are for extended Education later on in their life. Here we see GK Frank with the recipients – from left to right, Nichlos Furtado, Lucas Fontes, Grand Knight Frank Mauro, Joel Meier, and Steven Horianopolous.